Word reaches the Quietus this Friday afternoon (from an official source) that John Lydon and PiL are currently working on new songs together. We've seen some terrific gigs from the reunited Public Image Limited over the past year or so, most recently at Primavera. But we are anti-nostalgists, and generally hope that returning groups either vanish again, or knuckle down to writing new material. Glad tidings, then, that PiL's John Lydon, Lu Edmonds (guitarist), Bruce Smith (drummer), and Scott Firth (bass) are in a studio in a location that Lydon describes as being "in the outskirts of knowhere". Lydon has previously written with Edmonds and Smith for later PiL albums Happy and 9' so both have played and worked John throughout the late 80s. 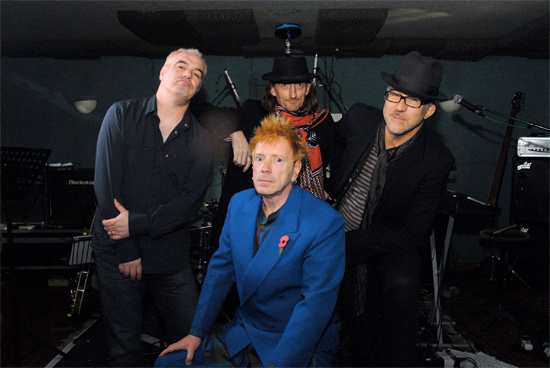 Lydon has long insisted that the PiL reunion was not solely about nostalgia, saying that the gigs were being done in part to fund studio time: "We've got no backing - no record company, no sponsors, nothing like that. The only way we can make money is the touring, and then we can make a new album," he told Billboard in 2010. "It's sort of like the old days of PiL, when the Pistols went kaput; I had to scrimp and scrape out of my own pocket. Not much has changed." Asked back then if he had songs ready, Lydon said, "Yeah, I've got piles. I never stop writing. Most of my influences have never really come from a musical act. It tends to be things like the poetic beat of a newscast. There's a rhythm to the way it's laid out. Movies can do that. Shakespeare and good poetry does that, and a bloody good book does that, or just a long walk." More on new material from PiL on The Quietus later this summer.